The semimembranosus is one of three hamstring muscles. Hamstring muscles run from the pelvis, down the back of the thigh, behind the knee, ending at the lower leg. The other two muscles which make up the hamstring are the biceps femoris and the semitendinosus. Together the hamstring muscles allow you to stretch your leg and bend your knee. Some of the most common hamstring injuries are tears, pulls and strains. Tears in the hamstring can either be partial or full. These types of injuries are normally experienced by runners, football payers and other professional athletes. 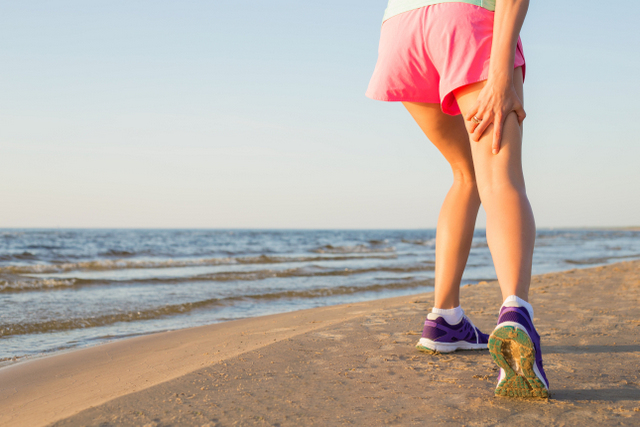 Excessive running, intense accelerations and decelerations can cause hamstring injuries. A strain in the hamstring muscle will be graded from 1 to 3 depending on the severity. Grade 1 is a mild strain and will usually quickly heal itself. A grade 3 strain is a full muscle tear that could take several months to heal. The main cause of a hamstring muscle injury is an overload of the muscle. Muscle overload can occur when the muscle is stretched beyond its capacity and a bearing a sudden load. If you are sprinting or running and experience a sudden sharp pain in the back your thigh that causes you stop, you may have damaged your hamstring. When a hamstring injury occurs, you might not be able to fully stretch your knee without experiencing some pain. Other symptoms include bruising on the back of your leg just below the knee and your hamstring feeling weak over several days. If you suspect you have a hamstring injury, a physician will be able to perform a full diagnosis. The doctor is likely to ask some questions about how the injury occurred and check for any soft tissue or bruising around the back of the leg.